Normandy, a region of northern France divided into 5 departments, Calvados, Eure, Manche, Orne and Seine Maritime, has long been a favourite with the British mainly due to its proximity to the UK and its long and interesting history, not always amicable! 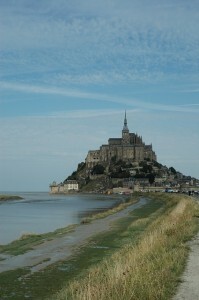 Normandy gets its name from the Vikings (the Northman /Norseman ). Its area used to cover the channel islands (Isles Anglo- Normand/ English-Norman Islands) . Normandy has often been likened to Devon which is not surprising given that they were once attached, however the sea is bluer and houses cheaper French side of the Channel. Of the departments the Manche (what the French call the channel but translates as Sleeve) is the most popular due to its large coastline which encompasses some of the D day landings beaches, the port of Cherbourg, and beaches running all the way down the coast to Granville and finishing with one of the most visited tourist attractions in France the Mont St Michel, which has been the centre of much conflict including the 100 year war with the English as well as being the subject of dispute between Brittany and Normandy, as the Bretons believe it belongs to them, but alas no, the river forms the boundary between the 2, so it falls on the side of Normandy. 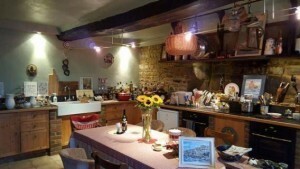 Gîtes and Chambre D’Hôtes ( B&B) in this area are very popular because of all the tourist attractions, although most people choose to stay inland in the peaceful Normandy countryside in traditional stone properties. Like the UK properties at the coast tend to be more expensive and you get much more for your money inland where you are around an hour of both Normandy and Brittany coasts. However not all attractions are to found at the coast. Normandy is known for its gastronomic delights associated with its production of butter, cream cheese and its cider, poiré (pear cider- champagne of Normandy), pommeau and Calvados (Apple Brandy). There are lots of individual producers of cheese in the Normandy countryside, where you can buy your cheese, cream and milk straight from the farm where the cheese is made from unpasteurised milk (lait cru) which makes a huge difference to its taste and much better than mass produced cheese. You will find farms dotted all around the countryside also many producing goats cheese (fromage du chevre). The strength of these varies widely depending on its producer. Calvados is a minimum of 2 years old but at this age it is best drunk in coffee (ask for a café calva) however after 15 years it takes on a different colour due to its oak barrels and becomes more mellow. 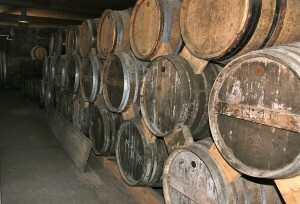 Licences to produce Calvados (cider and pommeau) are no longer being issued to private individuals and they cannot be transferred within the family as in the past from father to son, however as a concession you can make 10 litres of Calva a year for home consumption. The Normans in the countryside who have made these brews/distillations for centuries are undeterred by the small matter of a licence and production continues everywhere and stills come round in the middle of the night and people arrive at farms and leave with their car boots full of various bottles. From time to time customs descend and fines are issued, then things calm for a while then it is business as usual! Calvados traditionally made from apples can sometimes be made from apples and pears, however this production tends to be limited to a 20 km radius of the medieval town of Domfront which hosts a medieval festival every 2 years. 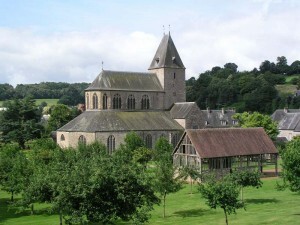 While on the topic of food, the village of Lonlay L’Abbaye is a popular tourist attraction and whilst many come to visit the Abbey, there are also many who come to visit the famous Abbaye biscuit factory! Their pure butter biscuits made from all local ingredients has a factory shop and there are tours which are free but you have to book to ensure you get the English version. After a visit to the factory many go up the road to the Fosse Arthur ( it would seem that the legendary King Arthur got everywhere) This is a large lake which is surrounded by rocks, which attracts climbers and walkers of all levels. Staying now with the water theme, the town of Mortain popular with artists for its light also attracts visitors and locals alike to its 2 waterfalls and its marked trails. Whilst nearby Ger a former pottery village ( whose production died out when the 1st world war claimed many lives of its potters) has a fascinating pottery museum which is a restored hamlet of former potters houses and kilns, which are now used for baking bread. The shop sells pots thrown from nearby areas, however pottery production is starting again in the hamlet with pottery classes. 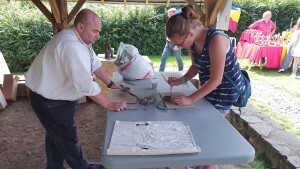 The Museum is open all year round but the last weekend in August they have an open weekend and invite potters from all over the country and have demonstrations, sales and entertainment for the children and in the evening light the fire pits. Continuing on the theme of pots this time copper ones, the town of Villedieu les Poeles is long known for its copper production, a pretty town worthy of a visit in its own right whether or not you want to invest in a copper pot or visit the museum of copper and lace. 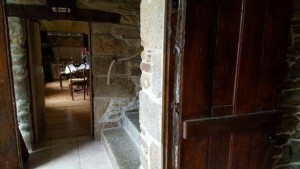 Normandy rich in history and culture, there is lots to do all year round for the tourist and the Manche countryside is the ideal place to establish your Gîte or Chambre D’Hôtes business. We have a fabulous property for sale in the Manche which has excellent potential to be operated as a gite complex, the property has been lovingly restored, it’s a reluctant sale & has only come to the market due to a work-relocation to the South of France. See full details here. This property would suit anyone wishing to live the dream but at the same time generate an income from paying guests who have come to enjoy the many attractions the region has to offer, including the Normandy countryside & beaches.